Posted on Mon, Jan 16, 2012 : 8:01 a.m. 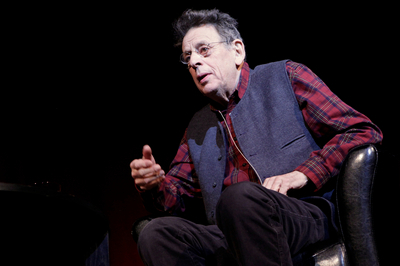 Composer Philip Glass discusses "Einstein on the Beach" at the Michigan Theater on Sunday. Now in Ann Arbor for a rare production of their groundbreaking work “Einstein on the Beach: An Opera in Four Acts,” composer Philip Glass and director Robert Wilson sat down Sunday to discuss the work as part of the Penny Stamps Speaker Series. Speaking before an absolutely packed MichiganTheater audience that came out for the free event, the collaborators attempted to break down the mystery behind the legendary production, which is being staged for only the fifth time ever this weekend at the Power Center by the University Musical Society. The performances, which run Friday through Sunday, mark only the second time that “Einstein on the Beach” in the U.S. outside of New York City. The Ann Arbor production starts an international tour for the work. “Ann Arbor is the place to be for the next week or so,” said Anne Bogart, a noted director and theater professor, who moderated Sunday’s discussion. “And I’m not saying that lightly. On Sunday, seated casually with Bogart, Wilson and Glass discussed the work’s genesis, its impact and how it has changed over the course of its 36 years from a revolutionary work of art to part of the canon. 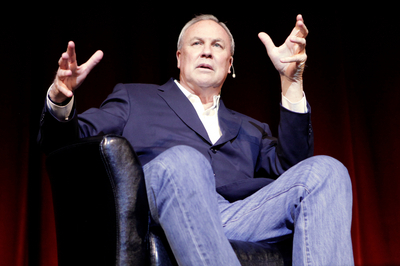 Robert Wilson speaks at the Michigan Theater. Wilson said he and Glass met when they wer both part of NewYork’s “Downtown” art scene. When they decided to try to collaborate in 1974, they approached it with few expectations. The resulting work, a five-hour-long, avant-garde opera with repeating themes and no linear storyline came about thanks to their two very different personalities, he said. “We think the same way, but we are two very different men,” he said. “But we share a common sense of time and space and how it’s structured. Glass said Wilson always imagined the work on a big stage, rather than in someone’s loft space in SoHo or in a tiny black-box theater. “We were part of a generation that believed in making a big statement,” he said. “They wanted me to put it on myself,” he recalled. “I was broke. I had no money. He said he sold tickets for as little as $2 an as much as $2,000. And just for fun, he put the $2 seats right next to the $2,000 seats. Glass said he and Wilson, without realizing it at the time, created one of the first works of art for the digital age. “I think we were working in a kind of binary language,” he said. “It was about using ones and zeroes and creating something out of the chunks of information that you generate. Despite its length, “Einstein” is performed without intermission. However, Wilson insisted that audiences are free to come and go as they please. Of course, that approach has an unexpected upside. “The Met never made so much money at the bar as they did during “Einstein at the Beach,” he joked. For his part, modern composer John Cage was unimpressed by “Einstein.“He’d say, ‘Philip, too many notes’ ” Glass recalled with a laugh about his old mentor. However, Glass insisted that without the audience, “Einstein” is an incomplete work. Of the Ann Arbor performances, which Wilson and Glass are in town this week to oversee, Glass said audiences are in for a treat. Mon, Jan 16, 2012 : 4:43 p.m.